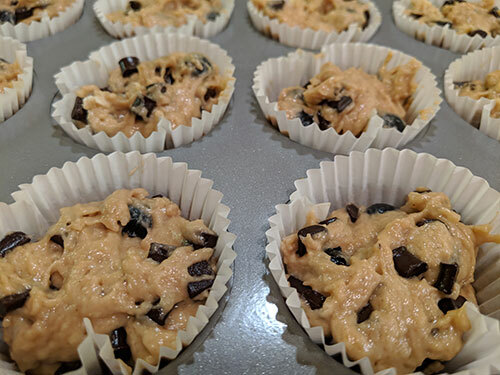 As promised yesterday, today I made the third batch/version of muffins. 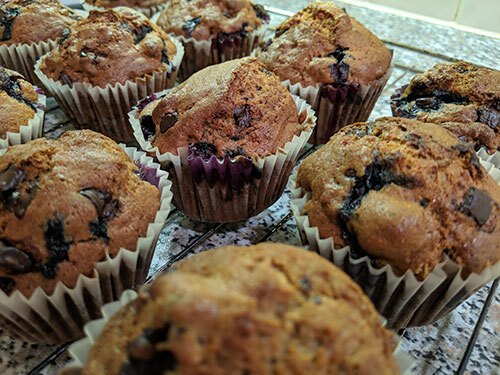 After the Cherries & Dark Chocolate Chip Muffins and the Dark Chocolate & Almond Muffins it was time for Blueberries and Dark Chocolate Chips today. Same as before the whole process took just over an hour. Again some will go into the freezer, some will be eaten over the next few days. And one I’ve eaten just now while writing this. Tasted very nice. I’ll take a break from them now, I’ve got enough in the freezer for a while. But I’m sure I’ll be making some again. For now I’ve got two breads in the oven, baking away.